What is it about fruits or vegetables, or anything in nature, that would inspire an artist to create a still-life painting or any kind of re-representation? Why go through so much hassle to depict what nature has already masterfully revealed to the eye? I have always asked myself this question, especially when I run into people who haphazardly repeat that hackneyed slogan: "art for art's sake." These are the same folk, mind you, that still consider fortune cookies something esoteric, who buy sunflower bobble-heads for their car, and who like to furnish their spaces with things they find "artsy." But, I digress. Here, I would like to mention that the focus of this article--and all future posts--is not to be overly critical of any person or group; rather, it centers on the elevation of all things human, and in that light, statements like "art for art's sake" can be construed as an innocuous, though fragile, attempt at self-expression. This is in fact is the reason why I created this blogger: so that visitors like you could engage your curiosities in a noble pursuit--that of legitimate self-expression. That is the lesson of the pear depicted here (to the left). Whatever painter painted it, must have conceived it first, abstractly, in his mind. The perfection of any still-life painting or portrait is not due to the artist's ability to originate the concept (e.g. of a pear). Instead, what we find is that the artist tries to depict, portray, express, or convey some noble and fascinating aspect of the original. Think about the painter as he studies the canvas, examines his instruments, selects his colors.. all before the sketch. And yet, the image rests almost immaculate in his mind, though in a mysterious and unresolved way, for he still yearns to behold it with his bodily senses. Does the genius of Michelangelo's Mona Lisa reside simply in an curious smirk? Or could there be something more that leads the spectator to muse at such beauty or the raw elements and skill that fashioned such an eerie smile? I'll let you be the judge. While most people might be tempted to eat one rather than paint one, pears have a lot in common with Mona Lisa. The object of still-life imagery is life itself, and so the painter's expression of a fruit can be equally exquiste to the spectator. While there is only a vague semblance between a pear and human figure (probably female), in the realm of beauty there are many common fibers. Notice the shape, color, size, symmetry, etc. All desireable qualities which human beings appreciate and seek to imitate in other facets of life: e.g. home decor, clothing, gardening, etc. 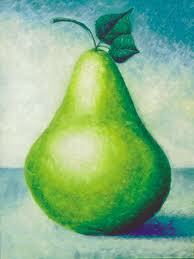 There is no mistaking a pear for any other fruit, say, an apple, apricot, or tomato. The same level of uniqueness is found in the other 2000 + fruits in the world. What is to be said, then, about people and their qualities? Well, that is a tougher question, not because we are higher on the food chain, but owing to the imperceptible characteristics of being human, viz. thoughts, emotions, intuitions, in a word, our very habit of being. It is our rare ability to produce on an interior level that vastly distinguishes us from plants and animals. While photosynthesis might be sufficient for describing inner plant life, it pails in comparison to the intricacy of human interiority. Neverthless, we can use apples and pears to descibe symbolically mysteries that affect human reality in a profound way. But this we will have to save for a later discussion. For now, I depart with a poetic question, a tid bit from Shakespeare's 18th sonnet: "Shall I compare thee to a summer’s day?" To which i will answer, "Nooo man, compare her to a juicy pear!" Vincent, very interesting perception. It reminded me of one of Aquinas 7 proofs of God's existance.